Yes, I’m just now trying out Julep Maven, thank you very much. I’m not much of a nails gal. I’ve always been a bit of a tomboy. Then again, up until I discovered elf about a year ago, I was never really a makeup gal, either. Fast forward to today, and I haven’t met a beauty product I won’t try. (Most women go through this phase in their teens. I am apparently going through it in my mid-30s.) I’d have to have been living under a rock to not know about Julep Maven, though. Don’t wanna hear my life story first? Click here to skip to the review. Despite my newfound love of makeup, I hadn’t really gotten to my nails. I stink at everything from shaping to actual polish application. I had to watch about 3 hours of YouTube tutorials just to figure out how to put on nail polish because I was sick of mine looking like… well… You know how you can look at a page in a coloring book and tell the difference between when a toddler’s work and an adult’s? The adult has neatly stayed within the line while the toddler’s page has scribbles everywhere. Yep. I’ve been living with toddler-painted nails. I practiced a bit, and while mine still doesn’t look like a professional did it, it looks a little better. Now I just need to learn how to shape. 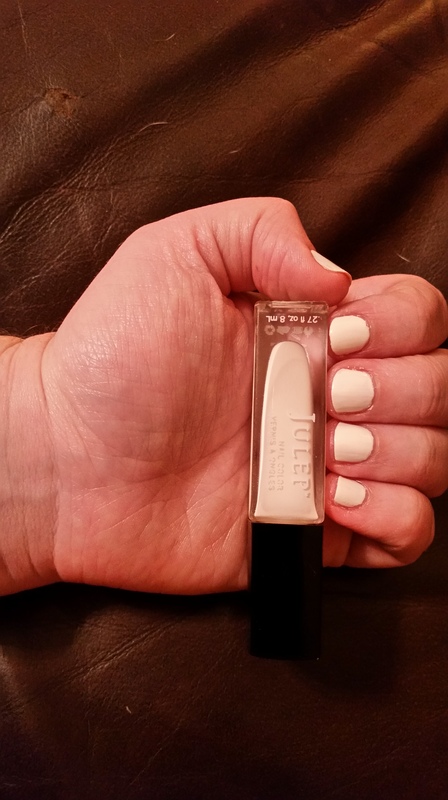 So here we go with Julep Maven… I saw the neutrals and thought it was probably a good place to start with high end polish. There’s also a bonus gold metallic eyeliner and I FREAKING LOVE GOLD METALLIC EYELINER. Worst case scenario? I hate it and I’m out the $2.99 I paid for shipping. 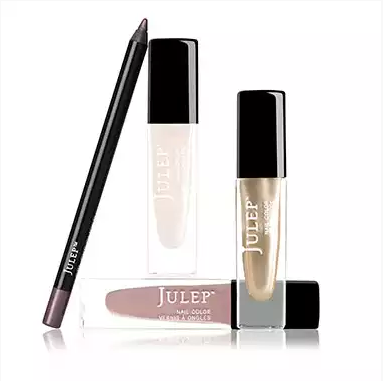 Before I get into the box review, let me go over the basics of how Julep Maven works. Every month for $24.99 you get three things. They can be polishes or other makeup products, tools, or even skincare products. The customization is, I think, what got me. If I was limited to nail polish only, I’d have never gone for it. You start out with a curated box based on your style profile, but once that box is revealed you have a few days before the order processes to switch out items. You can swap out a color. You can swap out all three items and replace them with just about anything else from skin care to makeup to tools. You can even skip the month if you like. The skip feature is also something that sold me. A lot of subscription services don’t have that, and since I like trying subscription services, I very much appreciate the option to pause or skip for a month or two if I get bored or while I try something else and then come back. Having to cancel and resub is a pain. Shaping? With a file? LOL! Also, my hand looks super weird in this picture. I promise I have normal hands. Yes, it’s messy. My fingers need a bib. 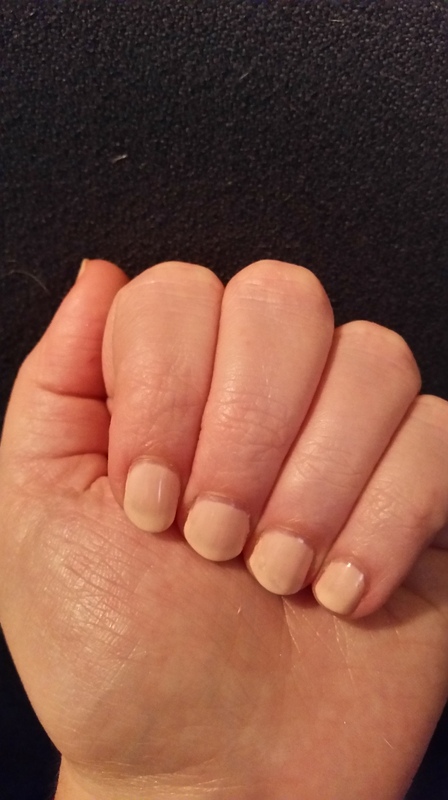 This is a 5-free polish (contains no dibutyl phthalate, toluene, formaldehyde, formaldehyde resin, or camphor). I’m okay-ish with whites. Sometimes it looks good on me. Sometimes it doesn’t. My current favorite above is a very light and sheer pink, so there’s potential. Whites have a tendency to streak, though. This isn’t an absolute WHITE white. I’d say it’s more of a bone color. There’s a very light, almost undetectable (pink?) undertone to the color, so you don’t get the harshness of a bright white. I have to say I’m impressed with how evenly the polish distributes itself after my messy application. It was nearly opaque in just one coat, but that could be contributed to the thickness of the polish. After two coats, it was definitely opaque. I could see a brush stroke or two, but nothing only because I was giving my nails a super duper closeup inspection. There were a few bubbles, though. Again, it’s super thick, and I don’t want to chance trying to thin it, but it’s passable for a day or two. After just three days it was already cracking and chipping. (I’ve already said I’m hard as hell on my hands.) I also managed to somehow get ink from a ballpoint pen on one of them, and I couldn’t get it off. Vanna is a good color that will go with just about anything, but I don’t think I’ll be re-ordering this one. Whitney is a great khaki-type color and is also 5-free. 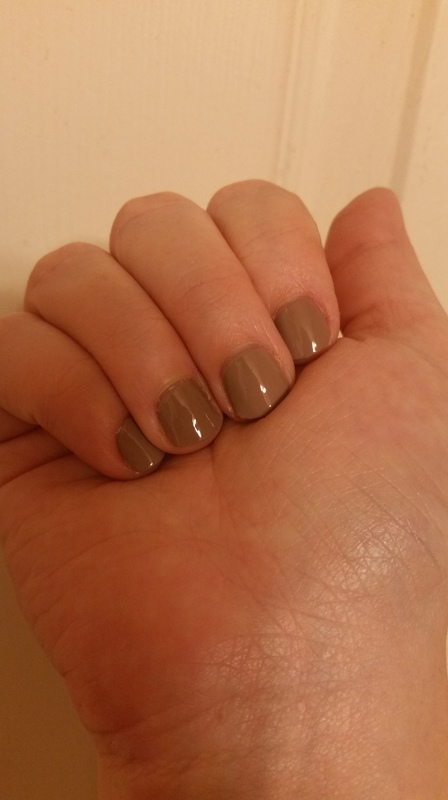 Julep describes it as a “mushroom grey beige creme.” I’d say that’s a pretty accurate description of the color. This was almost as thick as Vanna, so I immediately had reservations. This time, I gave it a full half-hour in between coats because I had the time, but I still got tons of bubbles. (No, I don’t shake my nail polish or any of those things that we’re told not to do.) I know it’s said that you can put a drop or two of polish remove in there to thin it out, but I really don’t want to take the risk with a high end polish. So I tried again, this time trying really, REALLY hard to get super duper thin coats. I was a little worried because the polish was going on kinda streaky as a result, but then absolute MAGIC happened as it dried. It all came together in a lovely, smooth layer. Again, I gave 30 minutes in between coats, not taking any risks. This time, I got super smooth nails with no lumps! So… Maybe this is a practice thing on getting the thickness just right? I might have to give Vanna another try. The color is beautiful, and it’s an immediate favorite. I even did my toes! It looks great with my skin tone, and since it’s a neutral I can wear it with anything. Like Vanna, it smooths out beautifully, and I see no brush strokes this time around. It’s almost opaque after the first coat, but it still needs a second coat. As you can see, I can easily see the brush strokes, and that’s not something I want to see. I was so focused, though, on making sure I had very thin coats. Perhaps I should try some thicker coats of this. But on first impression, I have to say that I wasn’t too impressed. It just ended up looking messy. 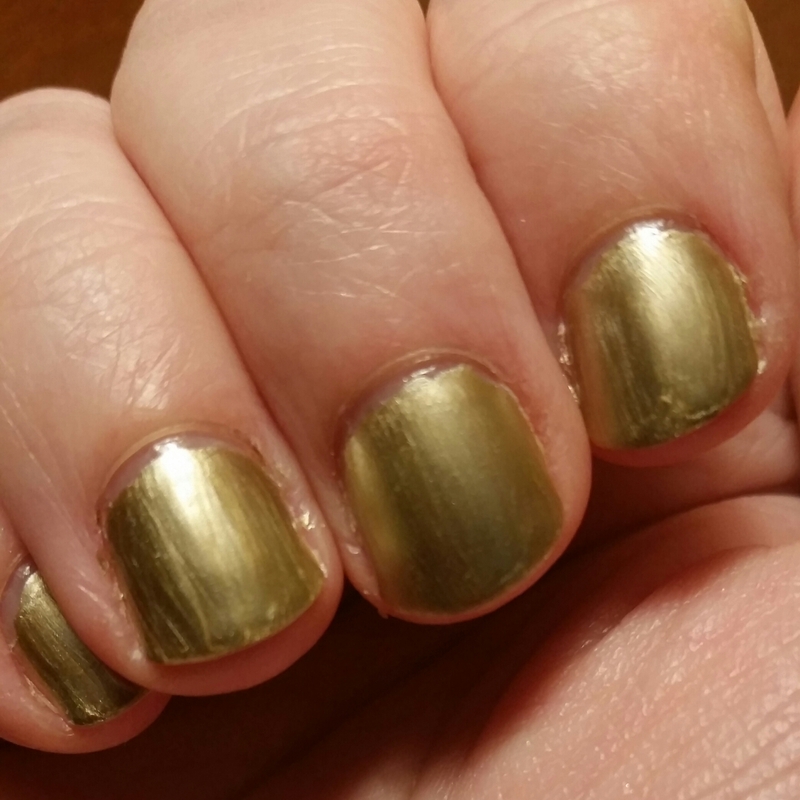 For a polish that would regularly cost $8-9 in a Maven box, I’d really expect better. This does no real justice to how metallic and pretty the color is, but you can at least see how smoothly it went on. I’m afraid I couldn’t find the link to purchase this one seperately outside of the Maven Secret Store, though it’s presence in there suggests that it’ll be available to purchase very soon. I freaking LOVE this stuff. In fact, it was probably my favorite item in the entire box. It goes perfectly with my beloved ELF Prism Eyeshadow Palette in Naked, so it already has a place in my collection. I glides on super smooth and gorgeous with just a light swipe. If you go with Maven and get three per box, they’re pretty reasonably priced at $8.33/each. Some are less if you find a good one on sale and add it on. I’ve paid around that much for drug store polishes, so I consider it reasonable. I think $10 is the most I’d pay for a polish, but it had better be a good polish. These $8 polishes do contain 0.27 oz of polish compared to the 0.45 oz I get in my $2 Wet n Wild and 0.51 oz in my $7 Revlon. That said, I’m much more likely to buy a different color of polish than repurchase a color because I ran out. I’ve never had to toss a bottle of polish because I used it all up. Wanna try Julep Maven? Here’s my referral link for a welcome box of your own.